Prince Charles is turning 70 on Nov. 14, and to celebrate, Royal Mail is releasing six new stamps featuring the Prince of Wales. On Saturday, Clarence House gave a glimpse of the collection of stamps, which feature a handful of royal family moments. In addition to a sweet portrait of Charles with his wife Camilla, Duchess of Cornwall, there is also a never-before-seen photo of Charles and his sons, Prince William and Prince Harry. 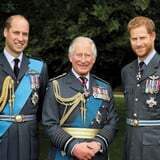 In the official photo, which was taken at the Royal Air Force celebration in July, the three princes are matching in their uniforms. Aww! We're definitely going to buy this one. Get a glimpse of the rest of the stamps ahead.